Joey King & Bailee Madison In ‘Thrifty Hunter’ Magazine For Fall! Actresses Joey King and Bailee Madison are taking ‘Thrifty Hunter’ magazine by storm for fall 2014! Both stars are featured in the magazine with fantastic, stylish photos. These young stars are at the forefront of what’s next in Hollywood. Read up on what’s to come for these talented girls in their interviews with ‘Thrifty Hunter’ on stands now. Check out their shoots below! 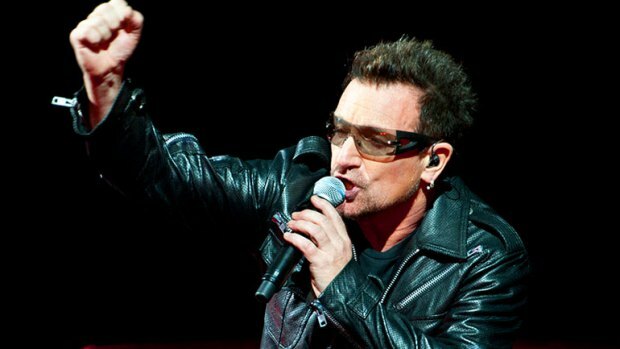 Bono also talked about upcoming tour plans, the surprise album, and the meteroic rise of their song Songs Of Innocence — which has racked up 38 million people have listened to in just 7 days. Hilary Duff Performs “All About You” Acoustic Version On Australian Radio — Watch Here! Hilary Duff has achieved a successful promo tour in Australia. She performed “All About You” on the Australian X Factor and got the new single into the iTunes top 10 overnight. She has also done a few radio interviews and performances for her new single. Hilary performed an acoustic version of “All About You” for Fifi and Dave. Ariana Grande: Good or Bad? — See Her Interview! Ariana Grande is known for playing Cat Valentine on Nickelodeon’s Victorious and Sam & Cat, but she is better known for her strong singing voice. In a recent interview with the Edge 96.ONE of Australia, she addressed the rumors that she stormed out of a photo shoot for not wanting to work with the camera crew. According to Grande, the reports that she is a major diva is “totally untrue and annoying.” She also went on to mention that it was the photographer who got upset with her because she wanted to change the top she was wearing. When she came back from changing, he was gone. She also said that the photographer put out untrue rumors about her. She assures everyone that what he had to say about her was nonsense. She also mentioned that she thinks she could dance a bit more when on stage and that some artist sing more than they dance. We’re glad Ariana isn’t turning into some big diva that wants things her way and that she can totally be down to earth. Check out the interview below. Jonathan Sadowski Dishes On Young And Hungry, Food, Disney And More — Check It Out! Moderator Does the amazing and hilarious cast make it easier or harder for you when you’re acting on set? Moderator Who’s the real comedian, off set? Jonathan Kym Whitley. I don’t think she has an off switch. She’s wonderful. She’s always joking, she definitely has us in stitches on and off set. It’s Kym giving a play-by-play of her daily life and the life of being a single mom. She always comes to the set with a story. She always walks in sort of frazzled and will be like, “You’ll never guess what happened to me today,” and then she’ll go into some story. Usually the first 15 or 20 minutes of rehearsal is her stand-up comedy hour. She’s wonderful. Moderator How would you describe your character? How similar are you to your character? Jonathan Josh is a 29-year-old dot-com millionaire, and he’s kind of a geek. He’s a computer geek. I think ultimately for somebody who seemingly has everything together, deep down inside he’s a big kid who has this great parental instinct, he always looks out for the people he’s surrounded by, and especially those who work for him and his friends. I think that’s the one tie that Josh and I have is that we’re both big kids. Josh loves Star Wars and Star Trek, and he geeks out over video games, and I’m not sure if you know this about me, but I do magic, I’m a magician, and I can sit down with my buddies and talk about magic until the sun comes up. Moderator What is your go-to comfort food? Moderator Have you been lucky enough to try some of the real life Gabi’s cooking? Jonathan I have, actually! She does a web series for ABC Family as well, and over the course of a few of the episodes I’ve been a guest on, we’ve been able to make some food. Her pantry pasta is phenomenal. It’s just the easiest, most simple thing. She makes a pretty wicked hot sauce, too! Moderator Is Emily Osment good at cooking in real life? Jonathan It wouldn’t surprise me if she was! I haven’t had the luxury of trying any of her food, but she seems like she’d be great in the kitchen. Moderator Do you have any cooking skills? Jonathan I can cook. My mother is very, very Italian, so I grew up cooking with her and we always had big family dinners. I prefer not to clean up, that’s my big thing, so in that sense I tend to go out to restaurants [laughs]. I love entertaining, though. I love being a host. It’s so conflicting! Moderator Have you ever had any disasters in the kitchen? Moderator Why do you think Josh keeps putting up with his fiancé Caroline instead of dating Gabi? Jonathan During the episodes you see that she does have some redeeming qualities, and in the pilot episode Josh said that she’s perfect for him. When she gives him a horse, or through terms of endearment, or the way she looks at him, I think there is something there that Josh is completely enamored with, and I think a little more will unfold as the series finale happens. It’s going to be a doozy! Moderator What’s it like working with Emily Osment? Moderator What do fans have to look forward to in next week’s finale? Jonathan There may or may not be a wedding in the finale. As I was reading the script, I was just pulling my hair out of my head it was so good! The writers did a really great job. My hat’s off to David Holden. He really knocked this script out of the park. Moderator If there were a spinoff of Young & Hungry, what would it be and who would be cast in it? Jonathan So many different scenarios went through my head just now [laughs]. I would love to see any one of the other characters, like Sofia, or Kym (Yolanda), or Elliot. Can you picture Elliot with his family sitting around the dinner table, the conversations that would happen? Or Kym (Yolanda) back at her place raising her kid? Or Sofia with her Latino family? I think there are just so many possibilities for humor there. Moderator What is your favorite Disney theme park? Jonathan I’ve only been to Disneyland! Moderator What is your favorite Disney ride or attraction? Jonathan The Tower of Terror is pretty good! I love the Haunted Mansion, Indiana Jones, Space Mountain. I couldn’t narrow it down to one, there are so many to choose from! Also, The Cars ride is awesome. Moderator What’s your favorite Disney food or restaurant? Jonathan I’ve always wanted to go to Club 33. I haven’t been there yet! I’m going to go there. Other than that who doesn’t love a good funnel cake? Moderator Who’s your favorite Disney character? Moderator What TV character would you want to be your best friend? Jonathan I’m a big Cheers fan! I think Woody would be a great best friend. Moderator What was your favorite Saturday morning cartoon growing up? Jonathan Muppet Babies. I watched that religiously. Moderator Who is your biggest TV crush of all time? Jonathan Rachel from Friends was always big for me. I always liked Christina Applegate on Married with Children when I was growing up, because I was from Chicago, it took place in Chicago, it held a special place in my heart. Moderator Which TV theme song would you pick for your ring tone? Jonathan ThunderCats! ThunderCats was great. He-Man was also awesome. No, you know what it would be, The A-Team! Moderator Do you think you could survive a zombie apocalypse? Jonathan Absolutely! I think I’ve watched enough zombie movies, and when me and my friends sit around and talk these are some of the questions, “All right, dude, you’ve got a paper clip and a piece of string, what do you do?” [laughs]. So I think we’ve been through about every scenario that could possibly happen. Moderator What was it like auditioning for Young & Hungry? Jonathan It was a really pleasant process! Sometimes the process can be grueling and you’re really getting in your head over the whole thing, but this was pain-free. I originally received the scripts, and after reading it I called my reps and I was like, “Yes, this is something I definitely want to do!” I went in and I met with David Holden and Ashley Tisdale and the casting directors, and after my initial audition they paired me up to do a work session with Emily (Osment) to test our on screen chemistry. After that, I did a screen test for the network, and I got a call that night saying that I was the guy! It’s so cool when you get a script like that and it’s something you really want to do and it works out. It was a great feeling. Moderator What’s your favorite part about filming the show? Jonathan The live audience. You can’t describe it. We get to make people laugh for a living. When you’re there on the set and you have 300 people who are completely invested in the show with you, and when you do something funny they laugh, and when it’s dramatic you can hear a pin drop. You just feel like you’re all on a ride together. It’s really cool. Moderator How would you describe the relationship between Josh and Elliot in one word? Moderator If you could build your own burrito, what would be in it? Jonathan I call it the perfect burrito: half pastor, half carne asada, no rice, easy beans, onions, cilantro, a little bit of lettuce, sour cream, and habanero hot sauce. Moderator Are you interested in any other aspects of the entertainment industry? Jonathan Absolutely! I’m a screenwriter. I’ve been writing for years. In college, I studied directing and playwriting. I was in the Acting Conservatory for a couple of years and I transferred out into directing and playwriting. I’ve written screenplays and TV shows, and currently trying to produce one of the films that I wrote that I’ll be directing as well. It’s kind of a dark thriller. You’ve got to make them laugh and you’ve got to make them scared! Don’t forget to tune-in to ABC Family next Wednesday at 8/7c for the summer finale of Young & Hungry! A: I have a lot of trouble flying, which is crazy because I spend a lot of my time on planes. I had a crazy flight a few years ago that made me a little phobic about flying, but I force myself to deal with it every time I get on a plane. I really value my time with my family and friends, especially since I have to be away working so much, so I guess I’m also fearful of there ever being a time where I’d have to be separated from family and friends such as, god forbid, a parent dying. I know eventually it’s a reality we all have to face but that would be at the very top of my list of things I’m terrified of. Once Upon A Time: The Complete Third Season arrives on Blu-ray and DVD August 19, 2014.